So it’s now August … how did that happen!! After a fun few months entertaining lots of friends and family who wanted to see our new house and of course doing lots of decorating, it has recently just occurred to me that we really need to get back to thinking about things for the wedding! Of course all the big stuff is booked so now it’s a case of fine tuning how we want the day to run and look. Making sure we hire anything in to help make the wedding look as we want it to for starters … we’ve had lots of ideas as to how we wanted the various areas of the wedding to look, how we wanted drinks and food to be served and some fun bits and pieces for our guests … so I’ve hired in a few more bits and pieces of furniture from the lovely Ginny at Virginias Vintage Hire. Although many brides and grooms don’t look at doing their timeline for the day until much nearer the time we felt it was also right to pencil in a chat with Sarah at Coombe Trenchard to discuss all our plans and check we were on the right track. So late last month we went for another quick visit. So glad we did as the gardens were looking beautiful … and Ant had only ever seen it in the depths of winter so it was lovely for him to see it again too. Sarah, as usual, was incredibly helpful … flagging up things that hadn’t occurred to us and really discussing what our plans would be if there was bad weather. We’d already been working on a timeline for the ideal day but decided we definitely needed a further ‘wet weather’ timeline for all our suppliers so everyone was 100% what was happening. The last time I wrote a blog post we were just contemplating having our engagement photo shoot with our wedding photographer Clare Kinchin. We decided, because we love Dartmoor so much, to head off up to Haytor in the end. I was disappointed first thing in the morning as we woke to very stormy skies and miserable weather … but in the end, despite getting a bit windswept and almost losing my hat on several occasions, the weather was perfect as the skies made for the most dramatic pictures. 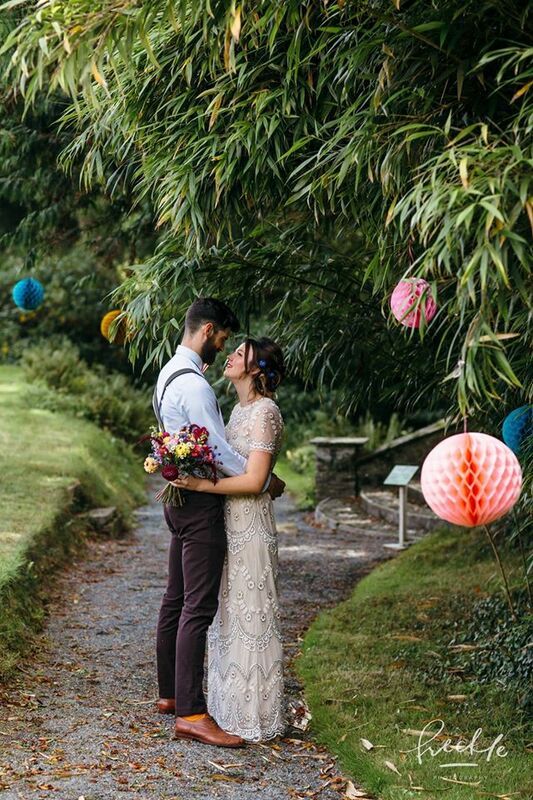 Clare bought along some sheep skulls, to carry on our animal skull motif from our Save the Date Cards, and we just absolutely love the photos! I would highly recommend an engagement shoot to anyone else getting married – even if it’s just a few weeks before the wedding – as it really helps you relax with your photographer, get used to being posed and allow your photographer to get a feel for how you photograph best as well. Hopefully in my next update our invitations (currently designing those!) will have gone out and we’ll have started receiving our RSVPs … exciting! 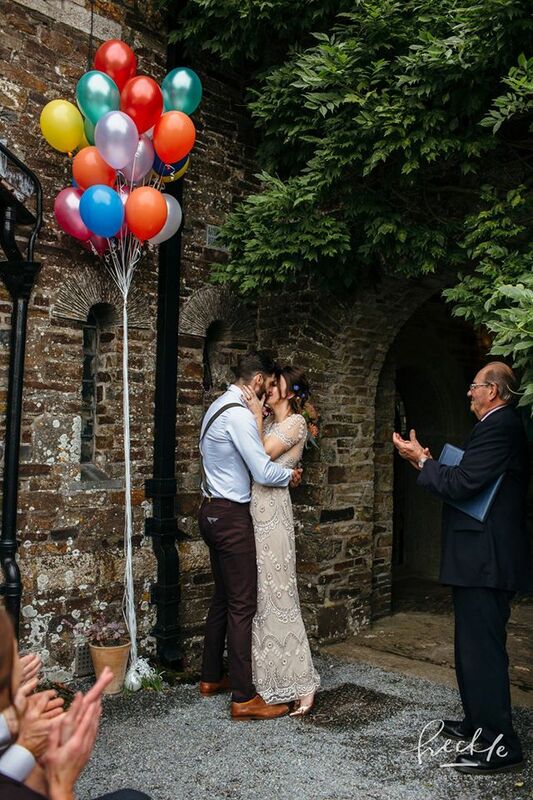 Cornish Celebrants – A Bespoke and Highly Personal Ceremony Option. ‘Your Wedding, Your Way’ is something we firmly believe in here at Coombe Trenchard. You will see this phrase in our digital brochure and on our social media feeds; we like to be as flexible and accommodating as possible to ensure a unique and personal experience for each of our couples. We have licensed 12 different locations within our house and grounds for legal ceremonies and shy away from formal packages or standard set ups. The luxury of opening our home for a select amount of weddings each year means we can get to know each couple and ensure we help them create their perfect celebration. Cornish Celebrants share our ethos of flexibility and allow couples to tailor make their celebration in a whole new way. We were excited to find out more and so arranged for Nicola and Denise, the lovely ladies behind this wonderful new venture, to visit Coombe Trenchard and enlighten us. Currently in England you need to be in a licensed area underneath a permanent structure to legally wed. This may be a Register Office, a Church or one of the beautiful locations dotted around Coombe Trenchard. The ceremony needs to contain specific phrases and if you are not getting hitched in a church you cannot have any religious content in your ceremony. The wording is very hard to personalise and music/readings will be checked for suitability. As we meet and get to know the lovely couples who choose our home for their Big Day, we realise just how varied and diverse their expectations and preferences are. Nicola and Denise, in their combined 29 years working for the Registration Service in Cornwall, saw the same need for bespoke options to provide a more personal and befitting ceremony and set about making that happen. Whilst the legal ceremony must still take place in a licensed area and could take place on a different day, Cornish Celebrants are on hand to conduct a separate celebratory ceremony purely of your making, with no guidelines or rules. This follows the continental model of a small ceremony at a registry office followed by a huge celebration in the setting of your choice. Therefore, if you want your ceremony on our bridge, within our stunning woodland, or even in the stream you can now have a tailored service conducted by friendly professionals to make your day as individual as you are. Mix religious, spiritual and non-religious readings, rituals and hymns with words chosen only by you and your partner for that special moment. Perfect for larger celebrations after intimate elopements/destination weddings and lovebirds who do not wish to conform to the rules imposed on traditional services, we are happy to be working alongside Cornish Celebrants to offer their bespoke services to our happy couples. “We loved Coombe Trenchard – such a stylish venue with such welcoming hosts. It encompasses the best of the Devon countryside with the far reaching views of Dartmoor, fabulous gardens and woodland and a beautiful Arts and Crafts house nestling in its setting. Simply stunning and we are so looking forward to conducting ceremonies here.” – Cornish Celebrants.